A Room represents a real-time audio, data, video, and/or screen-share session, and is the basic building block for a Programmable Video application. Participants represent client applications that are connected to a Room and sharing audio, data, and/or video media with one another. Tracks represent the individual audio, data, and video media streams that are shared within a Room. LocalTracks represent the audio, data, and video captured from the local client's media sources (for example, microphone and camera). RemoteTracks represent the audio, data, and video tracks from other participants connected to the Room. Call connect to connect to a Room from your web application. Once connected, you can send and receive audio and video streams with other Participants who are connected to the Room. Local audio, data, and/or video tracks, to begin sharing pre-created local media and data with other Participants in the Room upon connecting. The name of the Room specifies which Room you wish to join. If a Room by that name does not already exist, it will be created upon connection. If a Room by that name is already active, you'll be connected to the Room and receive notifications from any other Participants also connected to the same Room. Room names must be unique within an account. The name of the Room specifies which Room you wish to join. If client-side Room creation is enabled, and if a Room by that name does not already exist, it will be created upon connection. If a Room by that name is already active, you'll be connected to the Room and receive notifications from any other Participants also connected to the same Room. Room names must be unique within an account. Example: Create a Room called "DailyStandup"
注 : If you don’t specify a Type attribute, then Twilio will create a Room based on the default Type in the Room Settings. Note: Twilio will set the Room Type as "Group" by default on the Room Settings page. Once a Room is created, Twilio will fire a room-created webhook event, if the StatusCallback URL is set. You can set the StatusCallback URL on the Room Settings page, if you want create a Room from the client-side. If you create a Room using the REST API, then you need to provide a StatusCallback URL while creating the Room. If you'd like to join a Room you know already exists, you handle that exactly the same way as creating a Room: just pass the Room name to the connect method. Once in a Room, you'll receive a "participantConnected" event for each Participant that successfully joins. Querying the participants getter will return any existing Participants who have already joined the Room. Use Twilio's createLocalTracks API to gain access to the user's microphone and camera. Note that some browsers, such as Google Chrome, will only let your application access local media when your site is served from localhost or over HTTPS. the Tracks that the Participant eventually publishes. // Attach the Participant's Media to a <div> element. 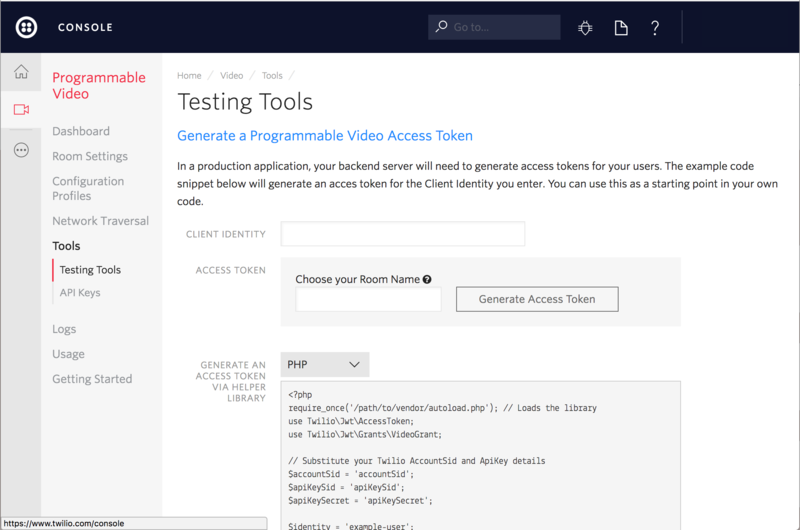 The Programmable Video REST API allows you to control your video applications from your back-end server via HTTP requests.